The “Traverse City Escape” vacation package (good from Jan. 2 until May 13) combines special rates at participating hotels and resorts with a wide range of discounts on winter recreation, shopping, dining and entertainment. Everything people love about Traverse City is still here -- great restaurants, charming downtown boutiques, wine tastings, and exhilarating outdoor recreation. This popular Michigan resort destination is offering visitors an added incentive to spend some winter/spring vacation time with them. Traverse City Tourism's special “Traverse City Escape” package (good from Jan. 2 until May 13) combines special rates at over 17 participating hotels and resorts with a wide range of discounts on winter recreation, shopping, dining and entertainment. There are deals at some of the area’s best restaurants and special discounts on shopping, spa services, movies, wine tastings and other entertainment. And for winter sports enthusiasts, the packages include coupons and discounts on trail passes, lift tickets, tubing and snowmobile rentals. 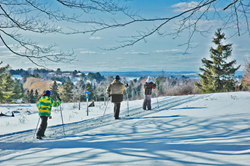 Best known as a summer vacation destination, the Traverse City region is winning accolades as a magnet for skiers, snowmobilers and snowshoe hikers who consider this one of the country’s most beautiful winter destinations. Budget Travel calls it one of the 11 “Coolest Winter Places in America” and Livability.com has it on its list of the nation’s best winter vacation destinations. Traverse City prides itself on the diversity of its winter experiences (both indoors and outdoors) and on the sheer physical beauty of its surroundings. The region presents a wide range of quality winter recreation for a comparatively moderate price – which appeals to people who don’t want to spend an entire vacation doing the same thing over and over.